Wrapping presents at Christmas time is a chore I tend to put off for as long as I possibly can and then I end up stress wrapping, which never turns out well! Which is why I am quite glad that packing a Christmas Eve box is so much easier! I probably should wrap the gifts but the personalised Christmas Eve box that I treated Liv to this year is far to cute and I’ve made the executive decision to simply fill it… she will be unwrapping presents the day after anyway! Deciding what to fill the Christmas Eve box with when this is the first time I have done this tradition was fortunately easier than expected thanks to a few weeks of stockpiling presents and hiding them away… and forgetting where I hid them. I have rifled through a selection of gifts and chose what I know Liv will love to open on Christmas Eve. It’s tradition to include a new pair of pyjama’s, which I managed to source from Primark, alongside some super cute, fluffy bootie slippers priced at £4 from Primark. The perfect accessory for keeping cosy during the Winter months! Chocolate is another great item to include, with so many selection boxes available from stores such as Tesco and Home Bargains, they are perfectly sized to fit in a Christmas Eve box. There is no denying that Liv is a huge fan of Itty Bittys from Hallmark, I am too! They are the cutest soft plus collectables with an extensive range of character favourites from Disney films, Marvel, DC Comics and more. With the amazing Harry Potter collection recently added to the range. I have a feeling Liv will believe Christmas has come a day early when she sees these! The Itty Bittys were featured in the recent Gifts for Harry Potter fans if you are looking for inspiration. A selection of GoGoPo slime and GooBallz will certainly be a treat and are wonderful token treats to include in the box. Check out more GoGoPo slime goodies in the recent Stocking Filler Slime From GoGoPo post. It will be the perfect time to reveal our new mince pie plate for Christmas Eve, personalised with Liv’s name. Born Gifted have a fantastic selection of personalised gift ideas for Christmas which you can check out, alongside a fabulous Mince Pie recipe for inspiration! 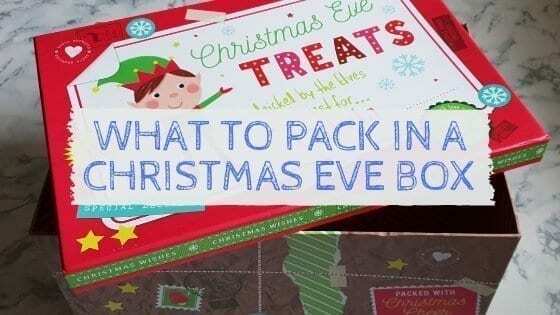 Will you be packing a Christmas Eve box this year? What do you tend to pack in it? This is a great guide – I hope the slime isn’t too messy haha! The Christmas Eve box was a huge success and fortunately no mess has been made with the slime… phew!